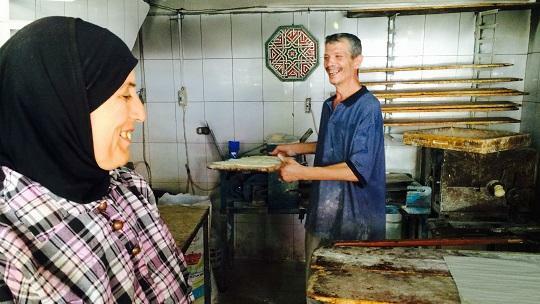 Ahlam is working with her husband; 15 years ago they started to sell manakish (Lebanese pizza with thyme and cheese) in the entrance of their building. Ahlam and her husband have about 100 clients each day and earn about 150 USD by day (200 USD on the weekend) with their activity. For now they cannot diversify more their products because they don't have fridge. For example, to sell pizza with meat ("lahme bajine"), the clients need to bring their own meat or order in advance and collect their product at a precise time. Ahlam and her husband have 4 daughters and 2 sons. According to tradition, when the daughters are married, they go live with their husband. That is why, they have the project to build two floors above their house to welcome the future wives of their two sons. As for their daughters, 3 are already married and have left the family home. Ahlam is very attached to Ebtissam, the Al Majmoua loan officer, with whom she has a relationship of trust for 4 years (in the middle of the picture above). Ebtissam has worked for 5 years at Al Majmoua and she is taking care of about 450 clients. If you want to finance other projects of micro-entrepreneurs in Lebanon on MicroWorld, click here.